This will probably be a short post. The following video has been around for some time now. 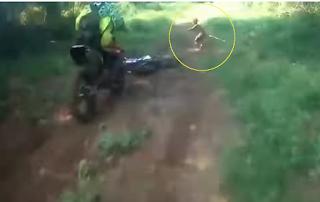 The video reportedly shows a "little man" filmed by some off road dirt bikers. 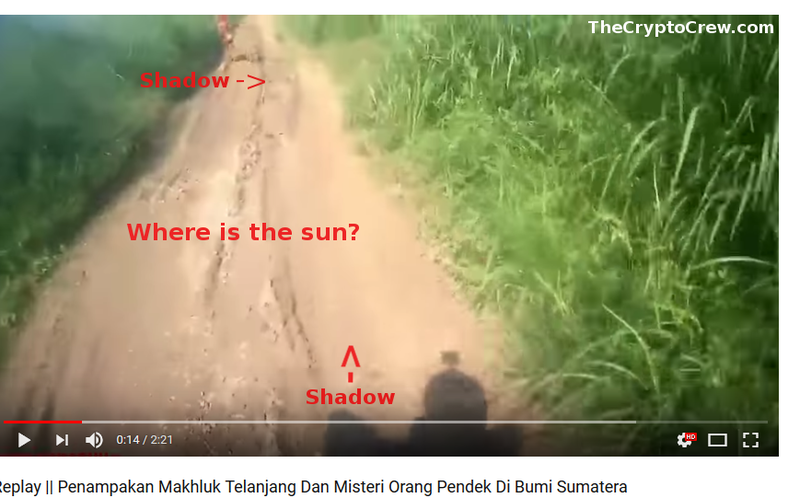 The video was supposedly shot in the middle of Aceh forest, Sumatra. The figure appears to be holding a staff of some sort. The lead biker crashes at the appearance of the "little man". The other bikers stop but one biker chases after the figure. The chase is caught on camera thanks to this helmet cam. 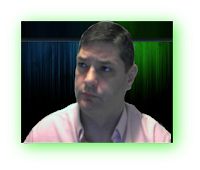 Here is the video and after that some more information. Wow, over 14 million views and it is still being debated. The video is rather exciting and it has spawned several "breakdowns" and conversations. Some say it is the famous Orang Pendek while other say it is an alien. So people are kind of all over the place as to what this might be. While the video is exciting and man think it is real, I personally think it is a fake and have evidence to support my claim. 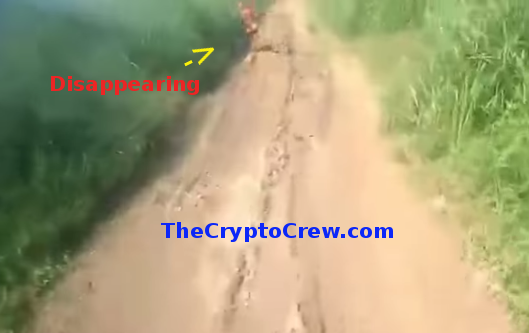 First there is an edit at the first of the video when the figure appears. This is 2 frames in sequence taken from the video. There are clearly frames missing. This suggest an edit to the film. The dark frame is the first frame and the lighter image is the second frame. There seems to be frames missing. But wait that is not all. 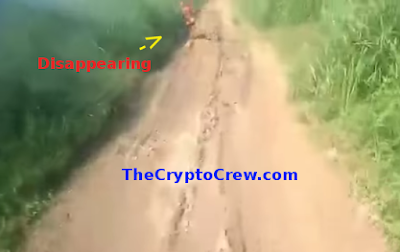 Towards the end of the video, as the biker is chasing the figure there are a couple noticeable red flags that point to a CGI faked video. The shadow of the biker and the running figure do not angle in the same direction. The sun is clearly behind the biker, causing his shadow to cast forward. But the figure's shadow is cast to the right as it hits the weeds. There is one part where the shadow is misplaced and on the back of the figure. And just one more thing before I close this post. If you go frame by frame during the video, you will see several other things that point to CGI. But as the figure goes in to the weeds, it starts to disappear before reaching the weeds. For those who do not know, you can go frame by frame on Youtube by using the "<" ">" on your keyboard. 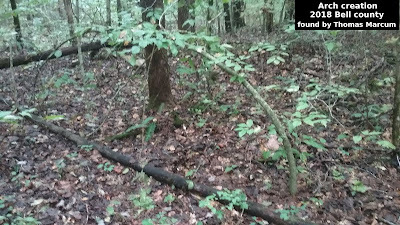 Here is the image of the figure disappearing before entering the weeds. So, all of this points to a computer generated image and in my opinion the video is fake. This was probably made to generate some views of the channel. The bikers explore some great areas and I guess this was a way to get people to the channel.